OPPO this week announced its entry into three new markets with consecutive launches in the United Kingdom, Turkey and Poland, demonstrating its ongoing commitment to bringing cutting-edge technology and innovative smartphone experiences to users in the EMEA region. The launches mark a major milestone for OPPO as it continues to elevate its global brand to meet its prominent position as the world's fifth-largest smartphone manufacturer. Just this past month, OPPO began operations in Saudi Arabia and opened its second regional hub for the Middle East within the UAE. OPPO kicked off its first in a series of launch events at the Tower Bridge in London on January 29th with a theme of "The Time is Now". Highlighting its proprietary SuperVOOC charging technology, flagship Find X and the R-series, the leading smartphone manufacturer also underscored its commitment to the market with its plans to open a Design Center in the heart of London to drive the design of limited-edition products, undertake aesthetics research and empower local creative talent. "The United Kingdom is an integral market for OPPO as we grow our global brand and we are deeply committed to our customers and partners there. As the fifth-largest smartphone manufacturer in the world, OPPO's UK launch is also an important milestone for the development of the smartphone industry as a whole," said Alen Wu, OPPO Global Vice President, President of Overseas Business. Events held on January 30th and January 31st represent OPPO's entry into its 8th and 9th European market as the company launched in Turkey and Poland, respectively. The three new markets serve to provide a more robust European ecosystem for the leading smartphone brand. 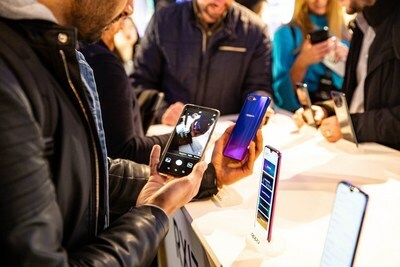 All three launch events were attended by representatives from long-standing partner Qualcomm, with both companies stressing the importance of their collaboration in the emergent 5G era, and OPPO indicating that its 5G smartphones were due to be commercially launched in 2019. "Thanks to our very important partnership with Qualcomm, at the end of last year we made the successful connection between our R15-based smartphone terminal and the 5G network and have laid a solid foundation for the future of 5G phones in 2019 and beyond," Wu stressed. With successful launches in France, Italy, Spain and the Netherlands in 2018, OPPO now counts operations in nine European markets, including Russia and Kazakhstan. OPPO's market-entry strategy in Europe highlights the company's commitment to laying deep roots in the region and continuing to build the brand through its innovative technologies, strategic investments and strong local partnerships. Over 250 million people use OPPO smartphones globally, with the company operating across more than 40 countries and regions through 400,000 sales points worldwide. In 2015, OPPO entered the Egyptian market. In 2016, OPPO set up its Middle East & Africa Sales Center in Cairo. The markets OPPO has entered in the Middle East and Africa include: Egypt, Algeria, Tunisia, Morocco, the UAE, Saudi Arabia, Qatar, Oman, Kenya and Nigeria.